Nintendo’s latest addition to the Pokémon mega-franchise is Pokémon Quest, an adorable (and relatively simple) tap-centric game currently available for the Nintendo Switch. Like other Nintendo’s spin-off Pokémon titles, Pokémon Quest features a unique art style. Once you enter the world of Tumblecube Island, you’ll find that the Island isn’t the only thing that’s cubic. All of the Pokémon you’ll encounter feature boxy, cube-like appearances which, while still strange, offers a fresh new look for fan favorite Pokémon—and, admittedly, they’re pretty cute. 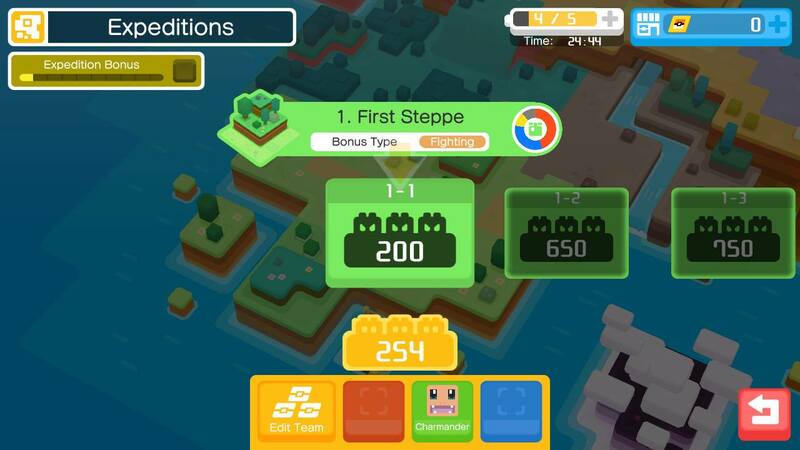 It’s worth noting that while Pokémon Quest features relatively simple gameplay, it’s certainly not without charm and can still offer an enjoyable experience (especially if you’re a fan of the adorable, cubic Pokémon). The game is “Free to Start” and does feature microtransactions as well as an energy gauge that you will have to wait to recharge (or spend money). The game currently features all 151 of the original Generation One line-up originally featured in Pokemon Red, Blue, and Yellow, and new Pokemon may be added in the future. Also, you don’t yet have a Switch, don’t worry—Pokémon Quest will be coming to smartphones later this month. 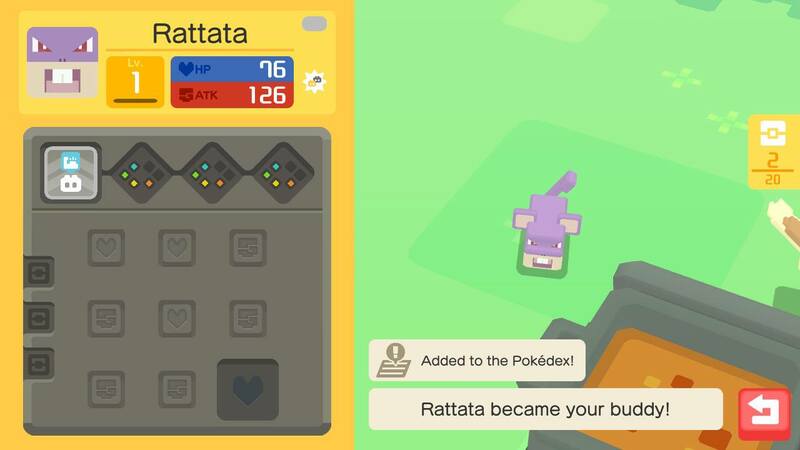 Here’s everything we think you’ll need to know to start your adventure in Pokémon Quest. On Tumblecube Island, you’ll be able to establish a base camp, battle and befriend wild Pokémon. Much like other Pokémon games, to do all this, you’ll first have to choose your desired starter Pokémon. You’re given five different Pokémon to choose from: Charmander, Bulbasaur, Squirtle, Pikachu, and Eevee. These Pokémon each have different stat distributions with the same stat point total, though stats have been simplified from other Pokémon titles to include just ATK (attack) and HP (health). The Pokémon you choose is up to you, and you will eventually be able to lure the other starter Pokémon to your encampment, so don’t worry too much—just pick your favorite! 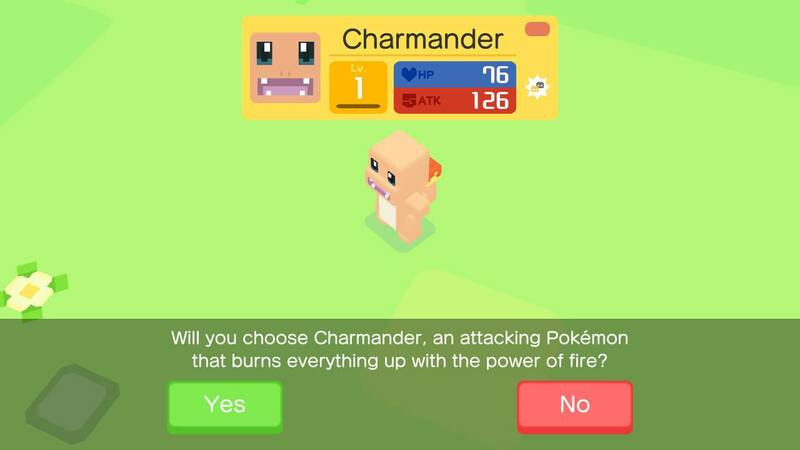 As with previous Pokémon games, each Pokémon does have a specific type (Water, Fire, etc. ), and you’ll use these types to battle in and clear specific stages. Once you’ve chosen your Pokémon, you’ll begin establishing your base on Tumblecube Island. Your base starts out as just a lonely cooking pot, but you can purchase decorations from the Poke Mart by using PM Tickets, the game’s currency. You’ll be able to log in once each day for a free allotment of PM Tickets and can earn them by completing Quests, so if you’re not interested in dropping cash, you’ll still be able to eventually collect enough to purchase some decorations. The decorations are not simply cosmetic in nature. Each features a different bonus, such as increasing drop rates, raising the chance of attracting Pokémon, and more. 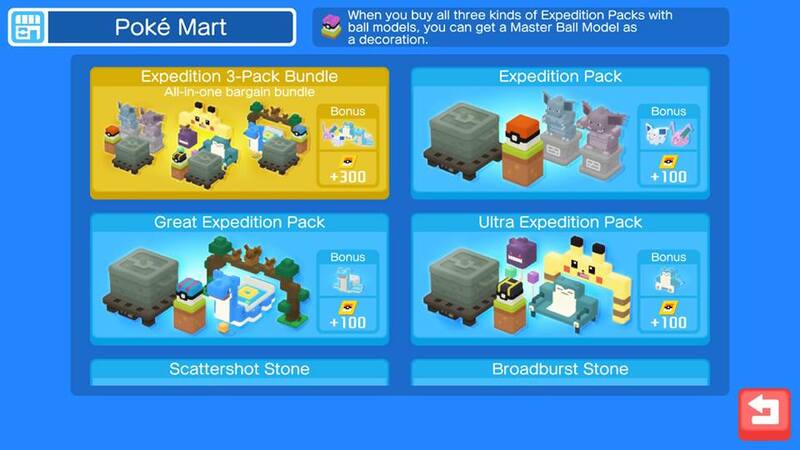 There are also multiple decorations sold in Expedition Packs, that can be purchased only with real money in the Nintendo eShop. The Expedition Pack costs range from $4.99 to $29.99 for the Expedition 3-Pack Bundle, which contains all of the eShop exclusive Expedition Packs at a very slight discount. If that’s your thing, go for it! Battling in Pokémon Quest is relatively simple. The Pokémon on your team will move toward enemies on their own and attack them. They will auto-attack the wild Pokémon, and can choose to have them execute specific moves by tapping the move. Each Pokémon can have two moves equipped, with cooldowns that will automatically replenish, so no worry of PP this time around. You can even turn on “Auto” battling to have your Pokémon choose their own moves without any input. Pokémon are considered either “close range” or “long range” and will attack accordingly. When choosing to send your Pokémon on an Expedition, your team’s strength will display as a number that is the sum of all of your Pokémon's HP and ATK stats. Each Expedition will show the enemies’ strength level, so make sure your team can handle the challenge! Additionally, Pokemon that are of the same Bonus Type as the area you’re challenging will gain increased stats. Finally, the small colorful wheel featured on the right side of the Expedition menu will show how likely you are to get ingredients of a specific color (such as the blue Bluk Berries or grey Fossils) on that specific stage. When your Pokémon defeat enemies, you’ll earn loot including Power Stones and ingredients. Power Stones can be equipped to each individual Pokémon's Power Charms to raise their stats. As your Pokemon level up, more sockets will unlock and you’ll gain access to better Power Stones. One of the biggest aspects of Pokémon Quest is, obviously, catching ‘em all. In this case, you’re not exactly catching them but rather luring them to join you at your camp with delicious cooked food. You’ll collect all of the ingredients you need to cook their favorite recipes by progressing in the Expeditions. These will also gradually allow you to upgrade your Cooking Pot, and you’ll be able to attract more rare Pokémon by cooking advanced recipes. There are two different categories of ingredients, “small” ingredients and “precious” ingredients. Different combinations of ingredients can be used to create meals to attract Pokémon of specific Types. Pokémon will also periodically visit on their own, so even if you’re behind on cooking you’ll still have a chance to attract some rare Pokémon—maybe even shiny ones! As in the mainline Pokémon games, shiny Pokémon are no stronger than their regular counterparts, but they feature alternative color palettes and are coveted by many players. 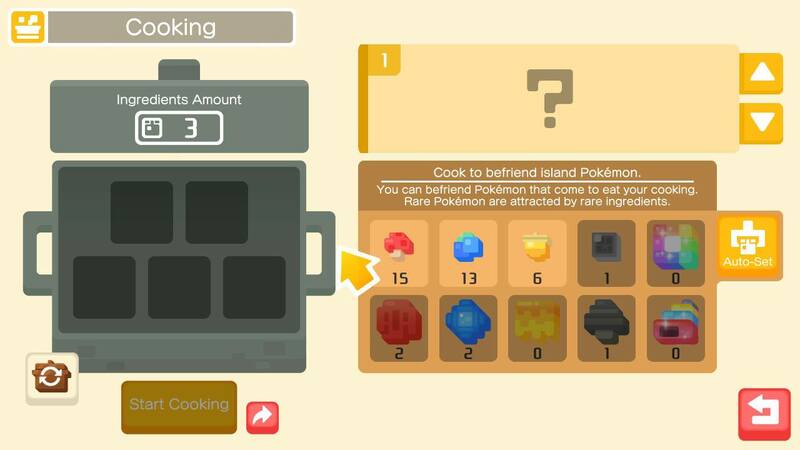 In order for your recipes to cook, you’ll have to send your Pokémon on Expeditions, and you can see the Expeditions required above the cooking pot. You don't need to successfully complete the Expeditions, so you can make your best attempts and your recipes will still be completed. You can cook only one recipe at a time, and spending PM tickets will finish cooking a dish instantly. Once the recipe is completed, it will immediately attract Pokémon to your camp. Best of luck in catching ‘em all!